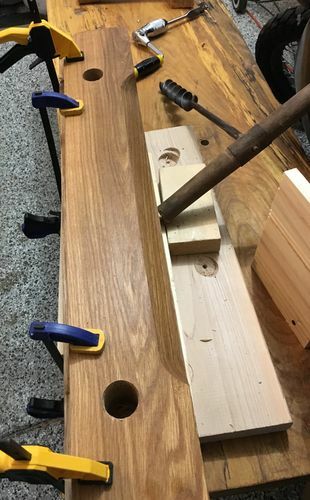 In the previous post, I left off just before drilling the two main holes for the vise screws. Yesterday I did those. 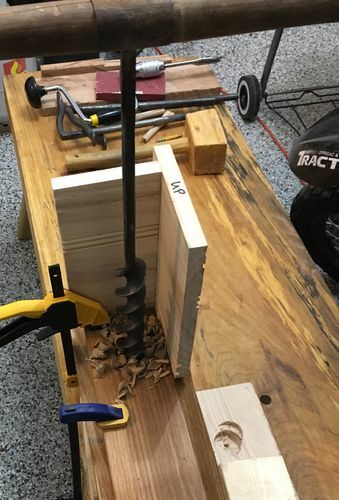 Based on feedback from some fellow Lumberjocks, I used my expanding spade bit to start the holes, as it has a nice sharp spur and produces a clean edge. Then I used the old T-handle auger bit I bought off eBay and cleaned up, which has no spurs (it’s designed for drilling holes for timber-framing, so I suspect a slightly ragged hole wasn’t a worry). 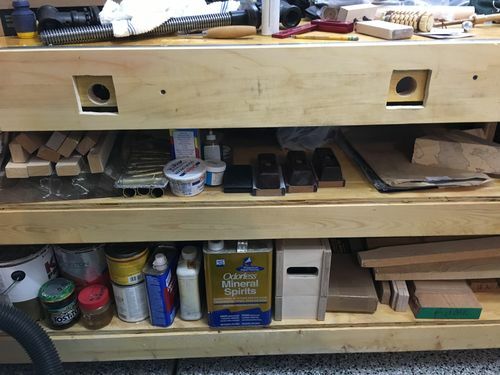 I built a jig to help keep me drilling straight into the vise chops without a drill press. 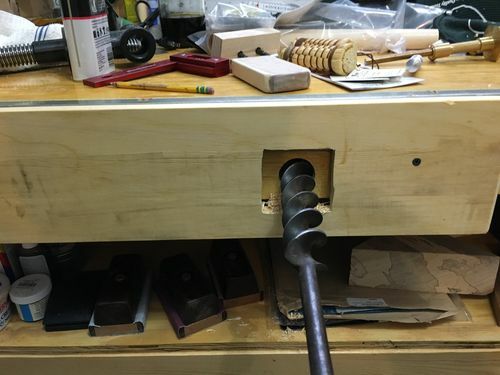 Eventually I want a post drill, but my hope is that I can get straight enough using a jig and cleaning up any misalignment with a tapered reamer after the fact. With the holes drilled, and blowout confined to the piece of pine, I felt like I was in pretty good shape when I wrapped for the day yesterday. Today I took that piece of pine and cut out the notches for the vise nuts, thereby getting rid of the blowout. 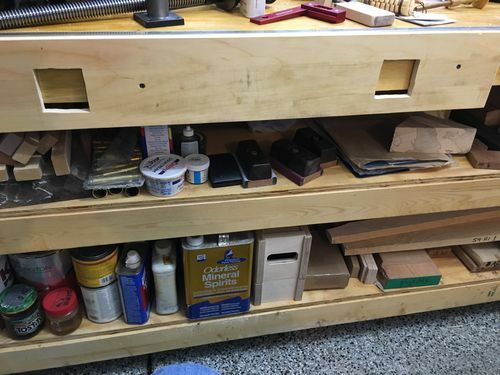 Then I screwed that piece to the front of the bench using a couple sheetrock screws. It shouldn’t be bearing any large loads, and there will be bolts running through it, but I needed to hold it in place for now. Next was placing the rear chop of the vise on that board, with the nuts in place, and marking where the holes need to go in the vise apron. Then drilling those with the expanding spade bit and the auger. With those holes drilled, I think I’m done drilling inch-and-a-half holes. 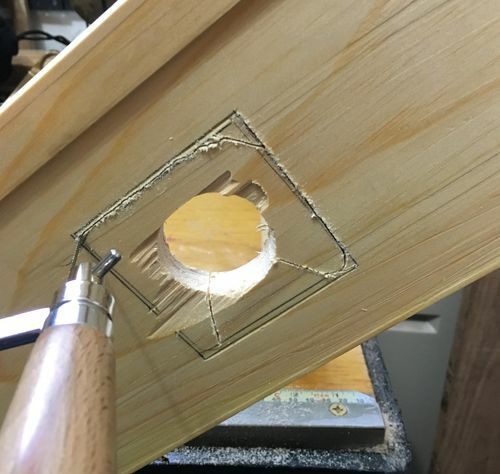 Next up is a set of four 3/8” holes through the rear jaw, pine board, and bench apron. Those will need 3/4” pockets for the bolt heads that will face out through the rear chop of the vise. 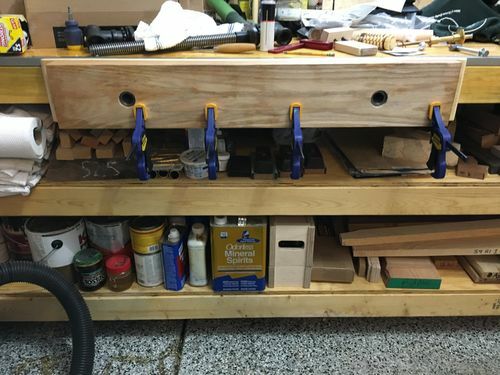 I’m not sure if I’m going to add another 2×4 behind the bench apron to hold the nuts for those bolts or not. I don’t think I need to, but it would offer a little additional support. That’s a decision I can make later, I guess. For now, it’s time to give my bad back a break and get some lunch in me. 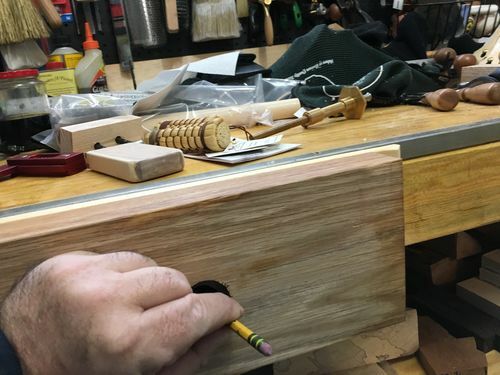 Those holes came out great Dave! Yeah, they did, Duck. Starting with the expanding spade bit with the sharp spur did the trick. Wouldn’t want to juggle bits like that if I had to drill a bunch of holes, but in this case it worked well. The back side of the apron is pretty raggedy. I didn’t put anything behind it, and it’s just a construction grade 2×4. But if someone gets their head back there to see the raggedy exit hole, they can clean it up for me. Thanks, Ron. I sometimes get a little frustrated at the slow pace I’m forced into lately, but the good part is that I’ve had plenty of time to think about all the ways I would normally screw this up, and figure out ways to protect me from myself. Of course there’s still plenty of chances for things to go wildly off the rails, but so far so good. Very clever the way you ‘re going about it Dave. Soon you will see the light at the end of the tunnel. Thanks, Ron. I sometimes get a little frustrated at the slow pace I m forced into lately, but the good part is that I ve had plenty of time to think about all the ways I would normally screw this up, and figure out ways to protect me from myself. Of course there s still plenty of chances for things to go wildly off the rails, but so far so good. Slow and methodical is the way to go, my friend … don’t beat yourself up! Remember … Rome was not built in a day! Thanks, Ron. I figure I’ll keep plugging away at it as I can. It’ll get done eventually. Probably before the swap I’m running starts in February, even.